While JTA is focused mostly on the USA and the North American market it may be of interest to see how kids in Europe like Star Wars toys. The “Kid’s License Monitor” is a useful quarterly survey to gauge what kids think about several toy licenses. Even though the full report is not available for free the most important findings are reported on the German toy fair website. The sample is 1,200 kids across the three countries, at least 400 kids for each country. As you can see boys older than 6 in Germany love Star Wars. Girls, not so much, which is not really a surprise. But now the bad news: considering both boys and girls across all ages Star Wars is struggling. The Kid’s License Monitor also measures appeal and “hype status”, hype means how much something is discussed in the peer group, how much it is a “hot topic”, according to the Kid’s License Monitor. In the UK, France and Germany Star Wars is not on the list of top 10 most appealing toy licenses. I would have shown you some graphics here but there would be no Star Wars on the list at all. One reason for that is most certainly the gender divide, with girls not liking Star Wars as much as boys. Across Europe the Minions are still one of the top toy licenses when it comes to appeal. Star Wars fares somewhat better when it comes to hype status, that is how much it is a hot topic in the peer group, as mentioned previously, here Star Wars is in 5th place in Germany and in 3rd place in France even. However, Star Wars is not among the top 10 hype licenses in the UK. But since the “Kid’s license monitor” is released every quarter, we can compare the results for Q3 2018 with Q3 2017, and here we see that one year ago Star Wars was not found among the top 10 most appealing toy licenses either. However, 12 months ago Star Wars was among the top 10 “hype” licenses, which were a hot topic in the peer group. It was the top 3 hype license in France, and the top 9 license in the UK, in Germany it was not among the top 10 hype licenses. So the Star Wars hype has increased in Germany, remains constant in France and has dropped in the UK in the meantime. When you look at the 1st quarter 2018, directly following the release of The Last Jedi worldwide, you find that Star Wars still didn’t make it to the top 10 most appealing toy licenses (across both boys and girls and ages 4-12) yet again, but it was a hot topic in France and Germany, it was the top 5 hype license in Germany and top 3 in France, it didn’t make it to the top 10 in the UK, however. The popularity of Star Wars among boys has improved over the course of the last 12 months, at least in Germany. As of Q3 2018 it is now the most popular toy license for German boys in the age range 7-12, which was shown further above. One year ago Star Wars was not in the top 3 at all in Germany. Once more, the data for France and the UK is not available for free and I can’t say anything about these two countries. But I would suppose that the situation might be similar there. With boys favoring Star Wars more than girls do. 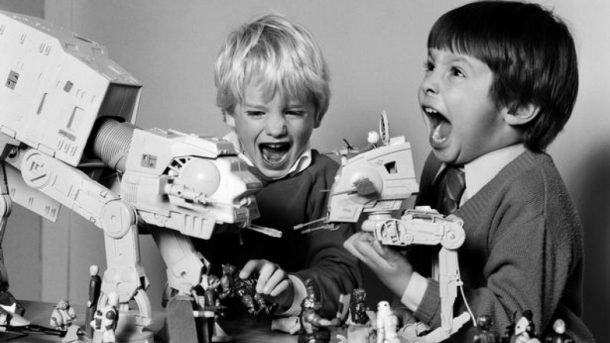 Star Wars, at least in the UK, France and Germany – the three most important toy markets and markets for Star Wars in Europe – is only really popular with boys, and only boys older than 6. It seems Hasbro’s and Lucasfilm’s efforts to get more girls into Star Wars and Star Wars toys is not that successful, at least in the UK, France and Germany. But mind you, this survey measures appeal, popularity and hype, not sales. We’re strictly talking about the former here. Star Wars is not among the top 10 most appealing toy licenses for kids at all, the reason for this is that girls and pre-school boys prefer other licenses, and they are the majority of kids. Star Wars is or can be a hot topic in the peer group, however. Star Wars is still a top 10 “hype” license in Germany and France. So it’s on the radar in these countries at least. Btw. the only top 10 appealing Marvel license showing up in the survey is Spider-Man, as the top 10 most appealing toy license in the UK, there are no Marvel licenses listed in France and Germany. Spider-Man is also the only toy license among the top 10 hype licenses in all three countries. No Avengers, no Black Panther. Which is interesting to note, I think, given the huge success of the movies. All in all Star Wars toys are popular among German boys, most likely among French boys as well (given the fact it’s been a top 3 hype license for quite a while now there) and probably even among boys in the UK, the brand can build on that. It remains to be seen if more girls can be convinced to like Star Wars toys. As of now Star Wars is still mostly a (toy) brand that interests boys in the top three major European toy markets. US Toy Market Shrinks 2% In 2018, Action Figure Sales Increase By 10%! Previous Article: Hasbro Toy Shop: Now Buy Their Stuff Through Walmart Online!